Geshe Thubten Sherab was born in 1967 in a small village in the province of Manang, the western part of Nepal, to a Kagyu-Nyingma family. He entered Kopan Monastery at the age of nine and completed his Geshe studies at Sera Je monastery in South India, followed by a year at Gyumed Tantric College. He then completed retreat and teaching assignments both in the U.S. and Asia. He served as Headmaster of Kopan Monastery's school for four years, overseeing debate training and tantric training activities. 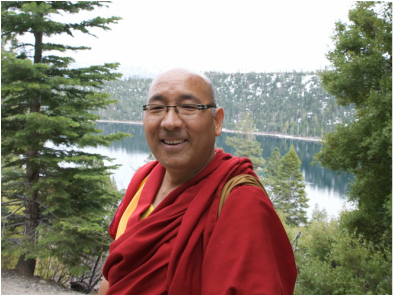 Geshe Sherab understands and connects very well with Western students, presenting the Dharma in an accessible, warm, and open manner. Australian-born Tibetan Buddhist nun Venerable Robina Courtin travels the world teaching Buddhist psychology and philosophy and helping those in need. Robina's life and work is the subject of Amiel Courtin-Wilson's award-winning film Chasing Buddha (2001) and ABC's Key to Freedom (2008). Ordained since the late 1970s, Robina has worked full time since then for Lama Thubten Yeshe and Lama Zopa Rinpoche's Foundation for the Preservation of the Mahayana Tradition (FPMT), a worldwide network of Buddhist centers and activities. Over the years, she has served as editorial director of Wisdom Publications, editor of Mandala Magazine, executive director of Liberation Prison Project, and as a touring teacher of Buddhism. Jon Landaw was born in Paterson, New Jersey, in 1944. He received his A.B. degree in English Literature from Dartmouth College in 1965 and spent three years teaching English as a Second Language with the Peace Corps in Iran (1966-69). Jon worked as English editor for the Translation Bureau of His Holiness the Dalai Lama in Dharamsala, India at the Library of Tibetan Works and Archives (1972-77) producing numerous texts under the guidance of Geshe Ngawang Dhargyey. As a student of Lama Yeshe and Lama Zopa Rinpoche since the mid-1970′s, he has edited numerous works for Wisdom Publications, including “Wisdom Energy” and “Introduction to Tantra.” He is also the author of “Prince Siddhartha,” a biography of Buddha for children, “Images of Enlightenment,” published by Snow Lion in 1993 and “Buddhism for Dummies”. As an instructor of Buddhist meditation, he has taught in numerous Dharma centers throughout the United States, Europe, Australia, New Zealand and elsewhere. Jon and his wife currently live in Capitola where he teaches regularly at the nearby Land of Medicine Buddha center. ​ Paula Chichester, has been a student of dance, the healing arts, music and Tibetan Buddhism since she was in high school in Berkeley, CA in the late '60s. Particularly inspired to find a culture that could promote outer and inner peace, she was mesmerized by Lama Thubten Yeshe's yogic prowess and kindness at a Puja in Pyramid Lake in 1980. Since then, she took on the experiment to find out if a western woman could indeed deeply benefit from traditional Tibetan Buddhist yogic training. This took her on a 38 year journey (so far) to India, into long solitary retreats and a life of uncertain material security but very clear spiritual benefit. Eternally grateful to her teachers and friends, at Kyabje Zopa Rinpoche's encouragement, she does her best to help others unravel their personal path to freedom. Karuna Cayton (LMFT, 1992) has been a student of Buddhist psychology and philosophy for over 30 years. A long time student of Lama Yeshe and Lama Zopa Rinpoche, he worked for the lamas at Kopan Monastery from 1975-1988. During that time he created and taught the secular studies program for the resident Tibetan and Nepali monks. He also assisted in running the Buddhist programs for foreign visitors and was the co-founder and director of the city center in Kathmandu, Himalayan Yogic Institute. He has been on the FPMT Board of Directors since 1988. Presently, he is the director of The Karuna Group, a coaching and counseling project. The Karuna Group works with individuals; couples and families as well as assists business leaders in transforming their organizations into preeminent enterprises based upon the Buddhist principles of Wisdom, Compassion, and Ethics. Karuna also teaches workshops and classes in the integration of western and Buddhist psychology. Venerable Tenzin Chogkyi bought a one-way ticket to India in early 1991 with the intention of meeting His Holiness the Dalai Lama. She then became a student not only of His Holiness, but also of Kirti Tsenshab Rinpoche and Lama Zopa Rinpoche. After returning to the US, Tenzin Chogkyi worked in various positions within FPMT – Director of Vajrapani Institute, Co-Director of FPMT International Office, FPMT Centre Services Coordinator – and also completed several long meditation retreats. She took novice ordination in 2004 with His Holiness the Dalai Lama, and since 2006 has been regularly teaching at various FPMT centers around the globe. She is a visiting teacher for the Liberation Prison Project and committed to animal rescue. She is the resident teacher at Gendun Drupba Centre in Canada since 2013.